In Spain, as in many other European countries, we have witnessed over the past five years how recession and economical decline have constricted the way we live, particularly in regard to housing and shelter. And with the pervasive downturn in the economy sparking both political and ethical crises, one of its clearest manifestations has been the proliferation of abandoned buildings seen across Spain, which have been documented by Julia Schulz-Dornburg in her series of images Modern Ruins. The impact of these images is strong, as strong as the image of an eviction can be, because they represent the crisis of values we’re immersed in now due to our capitalist approach to life. Modern Ruins represents the ruins of political thought. 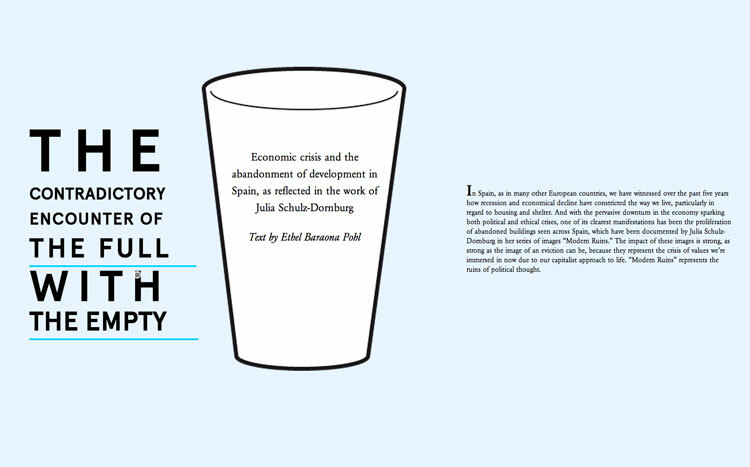 An article about the economic crisis and the abandonment of development in Spain, as reflected in the work of Julia Schulz-Dornburg. >> Complete article at Uncube.